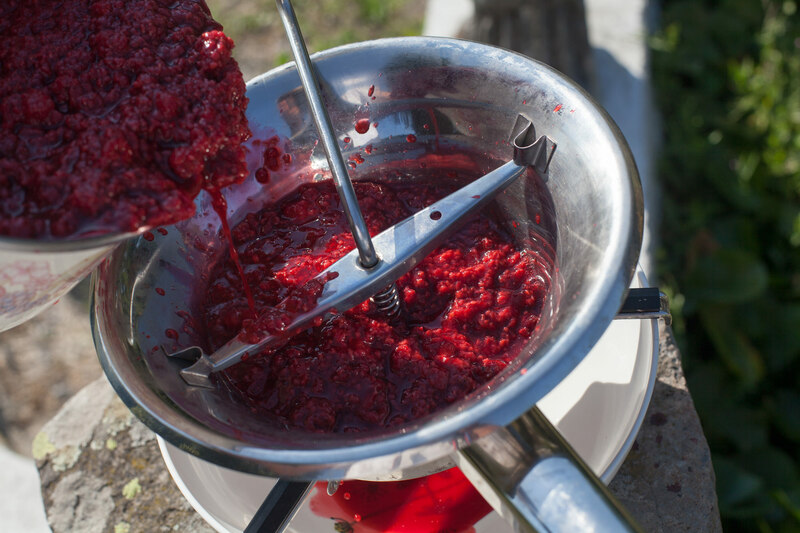 Soft fruit: using a muslin or a food mill to remove seeds makes different jams. To me, the food mill is a clear winner in terms of processing efficiency and convenience. 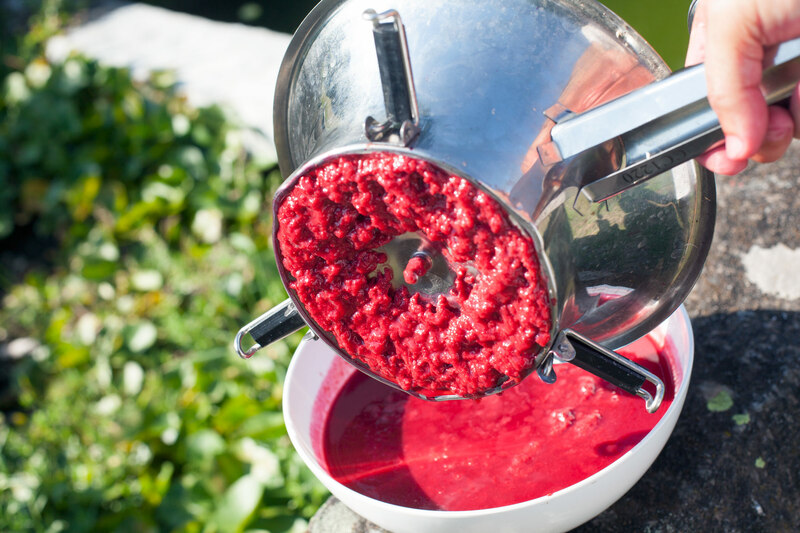 I usually use a food mill* when I make jam with soft fruit: it enables me to keep the pulp and therefore utilises more of the fruit, including the healthy fibers. Some will prefer the muslin, to make a clear jelly rather than a cloudy seedless jam. Let’s see how the two methods work with raspberries picked on the same day. I carried out the experiment this summer. 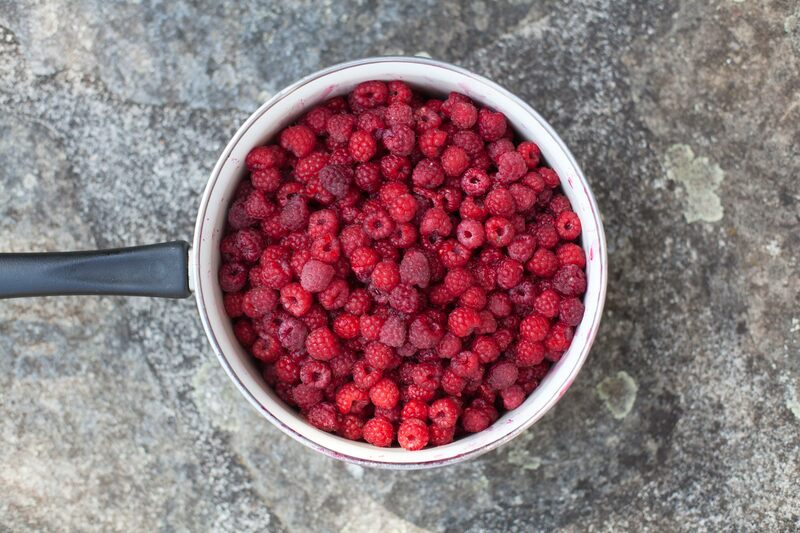 In both methods, the raspberries will be heated over a gentle heat for the juice to be released. Photos 12 August 2015. After ten minutes of gentle simmering from boiling point. Juice will now be easier to extract and some of the pectin will have been released from the seeds and skins. Muslin method. I used a kitchen towel instead of a jam muslin, which worked very well too. The juice goes through the cloth while the seeds, skins and most of the pulp are left in the towel. Twisting the cloth to compress its content enables to collect most of the juice. You might have to wait for the cloth to cool down a bit before doing that though, to avoid burning your hands. Food mill method, using the fine grid. Quicker. Two minutes per kilo of heated raspberries maybe? And there is no need to wait for cooling down. The main advantage of the food mill in my view is that most of the pulp is kept, and more of the pectin contained in the seeds and the skins goes into the puree. Left: juice with pulp, which I call puree, food mill method. Right: juice, muslin method. 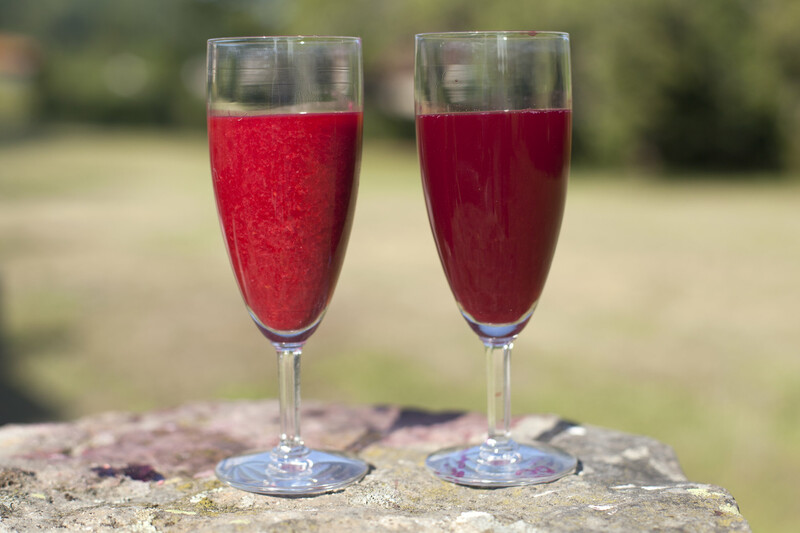 When cooked with added sugar, the juice will turn into a clear jelly. Adding a thickening agent might be necessary though, whereas the jam will usually set by itself when made with the puree. I must say that if the food mill method usually enables to get a set seedless jam, and is in that respect more efficient than the muslin method, it is not always the case. With raspberries it usually works, but for instance with blackberries sometimes the jam does not set if a thickening agent is not added (more on this in my article ‘Blackberry jam or blackberry coulis?’). 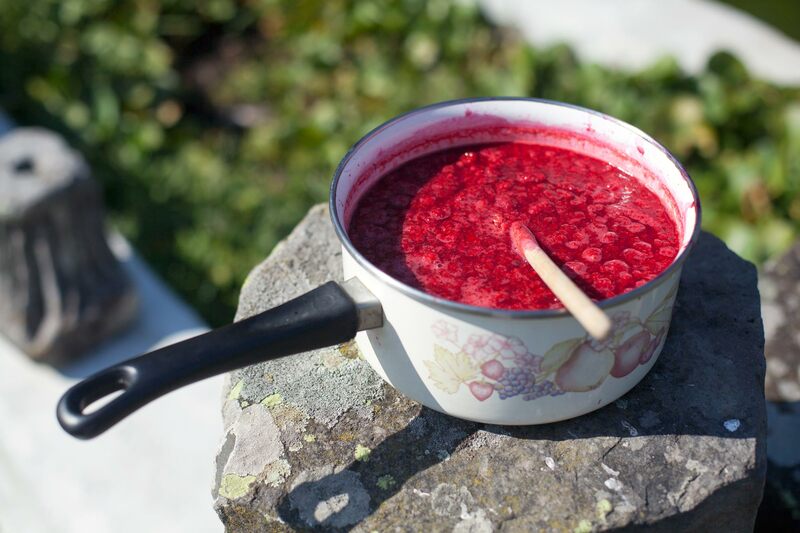 As a reminder, redcurrant or apple puree (or puree of any fruit rich in pectin), alternatively jam sugar, agar-agar (or other relevant thickening agents), in addition to the usual juice of half a lemon per kilo of fruit recommended by jam makers like Christine Ferber and myself, are means of making sure the jam will set. Cooking the jam for longer may help too. In conclusion, to me the food mill is a clear winner in terms of convenience and efficiency for jams made with soft fruit: it makes the jam-making process faster, gives a better chance for the jam to set without additives and enables to use more of the fruit. In the next article, we will look at the cloudy seedless jam and the clear jelly I made with the raspberry puree and juice above, and we will taste them. 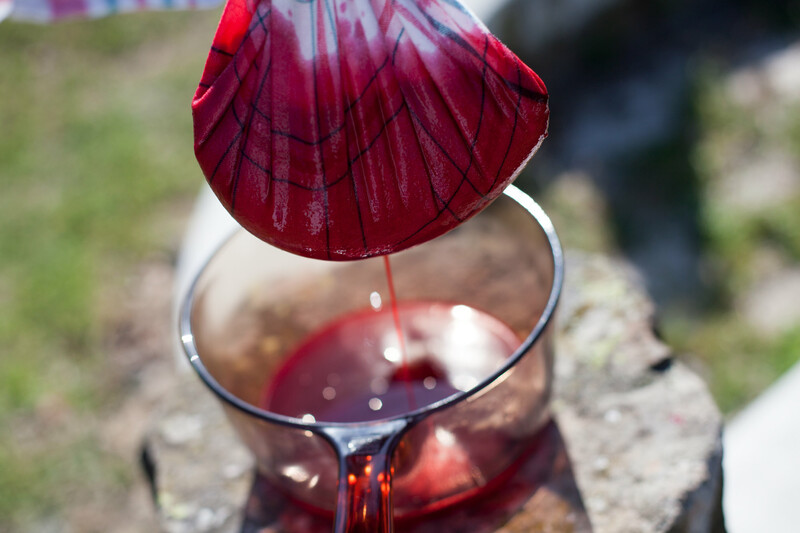 Will the jelly, made with the muslin, be better than the seedless jam made with the food mill? * “Food mill”: I have used the term “sieve” in my articles so far. Food mill is a better translation of the French word “moulin à légumes”, I think. This entry was posted in Eat and tagged All-fruit, France, Raspberries, Saint-Simon, Soft-fruit by Les Jardins d'ici. Bookmark the permalink.